As Doctors of Optometry, we ensure your new glasses fit your visual and eye health needs, as well as your fashion sense. Doctors of Optometry offer a wide variety of styles and brands. However, not all glasses are created equal. 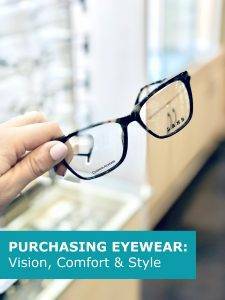 Some Eyeglass lenses provide clearer vision; some are more scratch or impact resistant. Research has found that many online eyewear purchases have failed at least one parameter of optical or impact testing. When ordering online, the consumer is taking on the role of a trained and licensed optical dispenser. This includes taking technical measurements and making critical decisions with respect to the frame, lens and material selection. If done incorrectly, it is not uncommon to have problems with your eyewear that may be immediate or develop after using your new eyeglasses for a period of time. Internet providers are unregulated, and are not required to comply with legislation that ensure the safety and accuracy of your finished eyewear.